After I graduated college, I lived in a very Greek part of Queens for a few years. Restaurants and cafés always played European-sounding rock, that featured often female singers (I assume it was Greek; it definitely wasn’t English), beautiful melodies, and guitar and drums mixed down low. Another World brought me back to those souvlaki-soaked days, but with lots more guitar soloing. The title track best represents that kind of European sound. It starts with crunchy guitars before Lyytinen’s pretty vocals step in over clean guitars to lend the song a lilting melody. Lyytinen has a voice similar to Amy Lee of Evanescence, although Lyytinen’s voice has a polish that wouldn’t be out-of-place on a Broadway stage. The song’s chorus is pretty and inspirational, but the track has an 80s vibe. You can almost picture it being used as part of a movie montage for when the film’s hero is taking positive steps to be better at a task. The payoff for many might be the long solo, which features a mix of shredding, but also melody. It’s a throwback kind of solo you don’t really hear anymore and anyone who grew up listening to hair metal should be transported to their happy place. 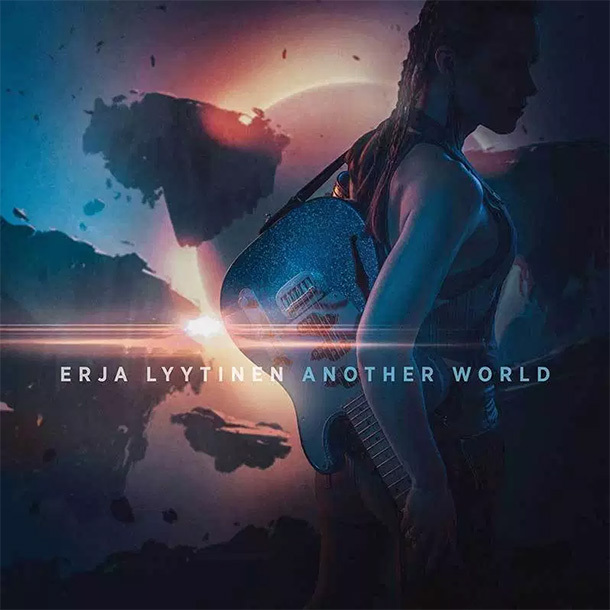 Guitarist Jennifer Batten, accomplished in her own right but, for better or for worse, best known for her role as Michael Jackson’s touring guitarist, joins Lyytinen for “Snake in the Grass,” another 80s-style track with plenty of shred and wailing guitars. The two even play harmony solos, a la every Iron Maiden song, which is another nice throwback touch. The Landreth tracks also deliver, as you might expect. “Wedding Day” is a fairly standard blues rock number, but with the two of them trading slide licks over the song, it becomes something cool and special. They both go to town trying to outdo each other. “Break My Heart Gently” features more atmospheric slide work, reminiscent of Daniel Lanois’ work. It’s not fair to knock an artist for changing things up. Lyytinen has done plenty of blues work, including 2014’s The Sky is Crying, which was an almost-all cover album of slide blues. She’s moving her music in a different direction, and that direction is probably more inspired by her native Finland than the American south. There’s a lot of great guitar on Another World, and a lot for 80s metal fans to love, but blues rock fans might be a little disappointed by the non-Landreth tracks. Having said that, it’s admirable that Lyytinen is doing the hard work of evolving her art rather than staying with the safe and familiar.